Matt Shanks’ latest picture book introduces us to Celine Beaufort. Celine lives a fairly ordinary life, doing ordinary things, but sometimes she gets to be the queen of a very special place—her very own kingdom by the sea. But when Celine claims the land for her own and builds a fortress to keep everything else out, the kingdom starts to lose its magic and Celine realises she’s made a terrible mistake. This is a lively and humorous story from the creator of Eric the Postie that touches on what it means to be a leader and also explores the themes of sharing and inclusivity. There is a strong environmental message running through the text, looking at ecosystems and the importance of maintaining balance for things to be healthy and to thrive. Shanks has a love and appreciation for the Australian landscape that shines through in his illustrative work, too. While younger readers will enjoy the rhyming elements, which make it a perfect read-aloud book, older readers will appreciate the political allegory it contains about how our sense of ownership over nature overpowers our potential to learn from natural forces. 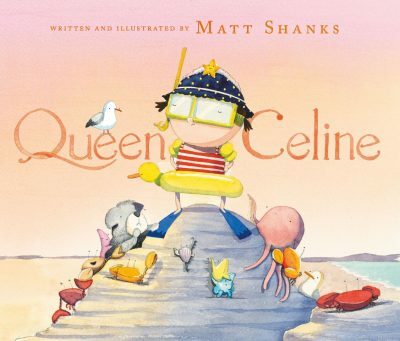 Host to a delightful cast of characters, Queen Celine is suitable for readers aged three and up.